Four girls tearing into their instruments: Quartet Rouge is an alternative string quartet creating percussive and edgy new grooves. These pro string players have turned their talents to the world of rock and pop to create original arrangements of their favorite tunes. Their set list is like hitting shuffle on your iPod: Radiohead, Black Eyed Peas, Alison Krauss, Michael Jackson, Amy Winehouse etc. Morphing their 18th Century instruments into drums, bass, guitar and voice, Quartet Rouge is refreshingly hip. Quartet Rouge performed in the Berkeley Repertory Theaters production of Green Days ” American Idiot” which is currently on Broadway. They are also featured on the CD soundtrack for the show and performed with Green Day at the 2010 Grammy’s award ceremony in Los Angeles. Quartet Rouge has performed as back up strings for Tommy Lee, Diana Krall, Josh Groban, Peter Cetera, Smokey Robinson and Trans Siberian Orchestra. 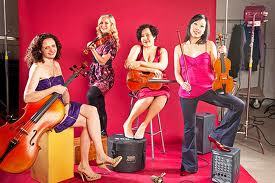 They have enjoyed recording and performing with numerous local SF Bay Area artists. The surprisingly lush orchestrations of Tom Kitt (a Tony-winning composer for “Next to Normal”) enhance the album’s melodic variety with the sweet softness of a solo acoustic guitar or the pulsating passion of febrile strings in keyboardist Carmel Dean’s dynamic nine-piece band.